St. John's Episcopal Church in Medina, New York is the oldest church congregation in Orleans County. Built of Medina Sandstone, the first service was held in the current building on Christmas Eve 1838, prior to completion of the structure in 1841. The interior of the building has been carefully restored, an ongoing process and work continues to maintain the fine stained glass windows commissioned by families as memorials over the years. In addition, there are two mosaic memorials by Jacob Holzer. Rite II Sunday Services are held at 10:30 each week, the Reverend Nancy Guenther officiating. Healing prayers are offered during the service on the fourth Sunday of the month. Study classes led by Nancy Guenther are ongoing, with books and materials selected for the appropriate liturgical season. Children's religious education and nursery care are also available. He Is Risen. The Lord Is Risen Indeed. Alleluia! We are very pleased to welcome Bishop Sean Rowe as our Bishop Provisional. 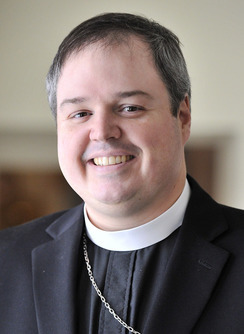 Bishop Rowe will serve for five years under an agreement between the Diocese of Western New York and the Diocese of Northwestern Pennsylvania. https://rustbeltepiscopal.org/. Our third Antiques Appraisal Day was a huge success! Thanks to all who brought in wonderful objects and stories to go with them. Find more updates and information using our NEWS tab.